Xylitol is the key ingredient in Xylimelts, and one reason is so effective. Xylitol is a natural sugar produced by plants, animals and the human body. Doctors and scientists have recommended the use of xylitol as a sugar replacement for years because it looks and tastes the same as other types of sugar, but rather than causing bacteria to become acidic and breakdown tooth enamel, xylitol does not become acidic when absorbed by bacteria and actually prevents bacteria from sticking to tooth enamel. Additionally, xylitol raises the overall pH level of saliva. When pH levels in the mouth rise above 7, extraneous calcium and phosphates adhere to the weakened portions of teeth strengthening enamel and repairing areas of decay. 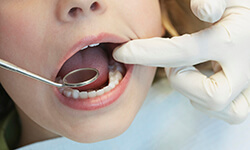 Whatever the cause, dry mouth feels uncomfortable, and is capable of causing significant damage to your dental health. Patients with dry mouth report experiencing a sticky or itchy feeling in the mouth or throat, always feeling thirsty, problems speaking, eating, or breathing, bad breath, and raw tongue. Most people experience dry mouth at some point in life, but if these symptoms persist for several days or weeks, consider seeking relief from Dr. Nauman and the Glisten Dental team. Xylimelts are small, discs made of xylitol and cellulose gum that adhere, discreetly to the teeth or gums for prolonged release of xylitol to produce saliva, freshen breath, and protect teeth. Xylimelts adhere securely to the teeth dissolving over a period of several hours to provide lasting effect. Because the adhesive is so secure, Xylimelts are even safe to use during sleep. As the discs breakdown, the xylitol increase the pH levels in the mouth protecting and fortifying teeth. If you suffer from dry mouth, call Dr. Nauman and Glisten Dental to find out more about how xylitol and Xylimelts can help you enhance your smile. Our Tulsa, OK office invites patients from surrounding communities Broken Arrow, Bixby, Leonard, Jenks, and Coweta to schedule an appointment today.